Schwalbe's Energizer Plus tyre is specially designed for use on electrically assisted bicycles (e-bikes, pedelecs and speed-pedelecs). A high quality compound gives a combination of low rolling resistance and very good grip, especially important when cornering at speed. This tyre has the ECE-R75 mark and is certified for use even on faster electrically assisted bicycles at up to 50 km/h. 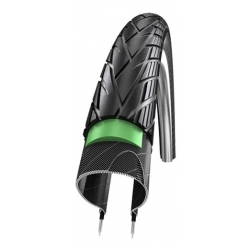 Level 5 Greenguard protection for a very high degree of puncture resistance. Tyre sizes are shown under Available Options above. Please refer to our comprehensive blog post about tyre and wheel sizing to ensure that you buy the correct size of tyre for your bicycle.